This is somewhat related to my previous post. I didn’t want to include my user profile value in the form and instead add it during validation. This caused the model validation to be skipped in part. I had to do some gymnastics to get it to run. In this latest attempt, I have instead included that profile as a hidden field and compare it to the current user profile. Much cleaner! Now all I have to to is get that current value into the form. I also set the profile field to hidden here. This is much easier and clearer than my previous method. Not bad for working late on a Wednesday night. I recently had a situation where the validate_unique method from my model wasn’t running. This is because one of the fields involved in the unique test wasn’t included in the form. I tried many things in the form and the view before landing on this solution: I first injected the field into the object of the UpdateView, then ran the test in the Form in _post_clean. Is there a better way to do this that doesn’t involve overriding an internal function? Got any help for me? Please post an answer here or on SO. I’ll share the solution here once I get one. The whole point of having a garage door is so we can close it when access isn’t needed. Otherwise there would just be a hole in the wall. However, in my house we have this bad habit of not closing it – sometimes when we are home and sometimes when we leave. This project was inspired by an all night “open to all” garage. UPDATE: I’ve replaced the Magnetic Reed Switch with a much hardier commercial model. The Enforcer works much better! One could substitute other WiFi enabled project boards, such as the Node MCU. I used the Wemos partly because of the availability of the shields which make for a compact build. The ProtoBoard shield was not required, but helped me get past my substandard soldering skills. I don’t usually solder all of the pins on the D1 shields; just those that are needed. However, there is no penalty for completeness. Be sure all of the pins listed above are soldered in all headers. This code is doing three things each cycle through the loop. First, it checks the state of the door and reports any changes. Next, the temperature and pressure are checked and reported. Finally, the client loop will look for any commands from MQTT and handle accordingly. If the door is found to be open, it is not reported right away. Instead a counter is incremented, and only after five consecutive readings of open is that status returned. The goal here is to ignore spurious readings. A return value of closed is assumed correct and set on first reading. A change in the door status is immediately reported via MQTT. The process also reports the status each minute regardless of a change to ensure Home Assistant is always in sync. Updates are limited to once every 10 minutes. 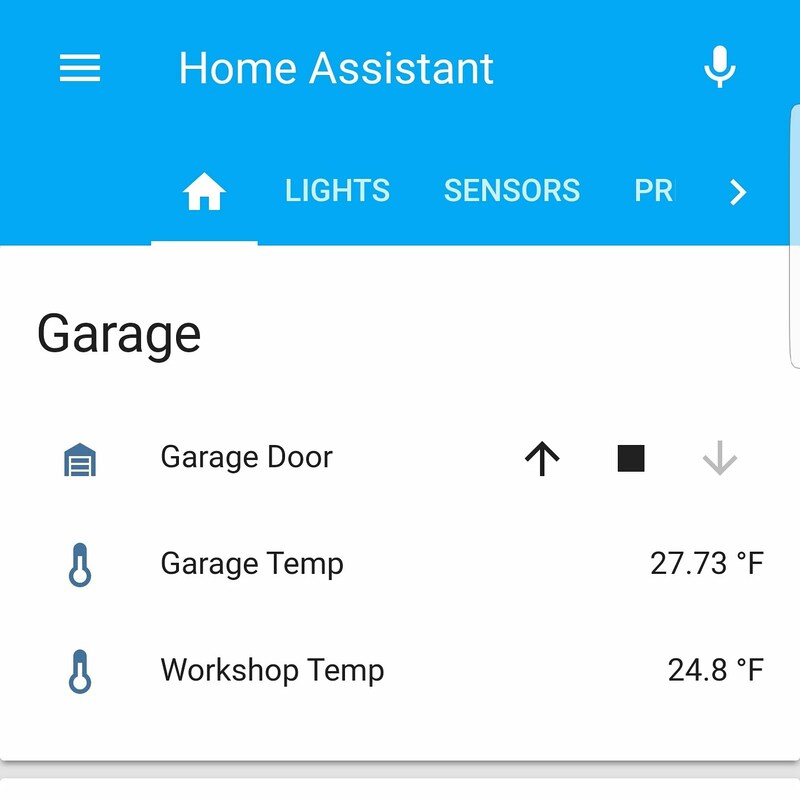 No need to overwhelm Home Assistant with readings. In the begin() function for the BMP, I specify which pins to use for the I2C interface. On the D1 Mini these default to D1 and D2, but those pins were already in use by the relay and reed swtich. D5 and D6 are recruited to take the job. The callback routine catches a MQTT message. The payload of “OPEN” is the only command that will “push” the button – closing the realy for 6/10 of a second. I’m using a few other libraries in this program. WiFiManager handles the WiFi connection, storing the credentials in nonvolitile memory. It is important to note that WiFiManager will open a WiFi acces point if no credentials are found or the connection attempt fails. Connect to this AP using a laptop or phone, access 192.168.4.1, and follow on the onscreen instructions to setup your WiFi information. 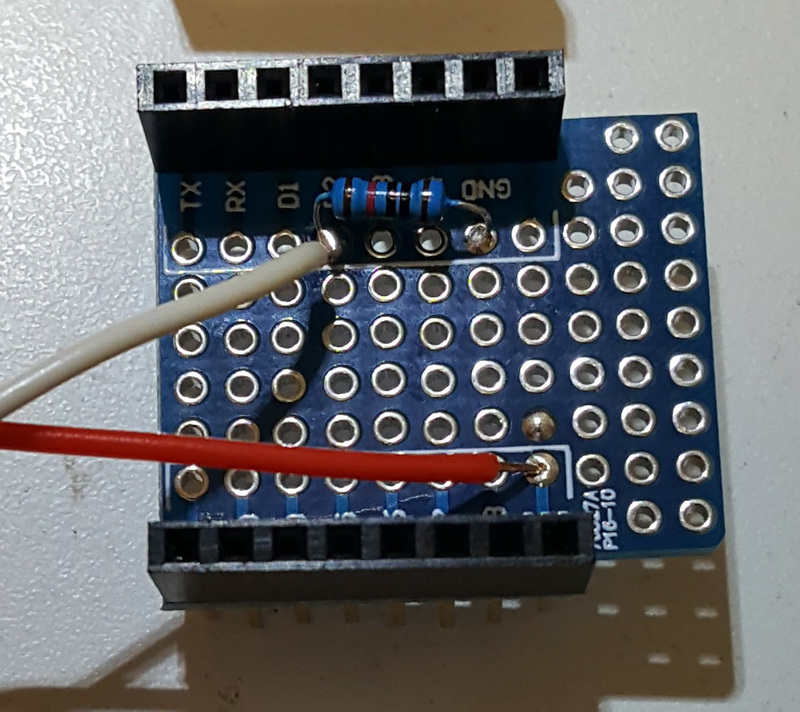 ESP8266HTTPUpdateServer accepts program updates over the air. No need to climb up a ladder to connect your laptop! 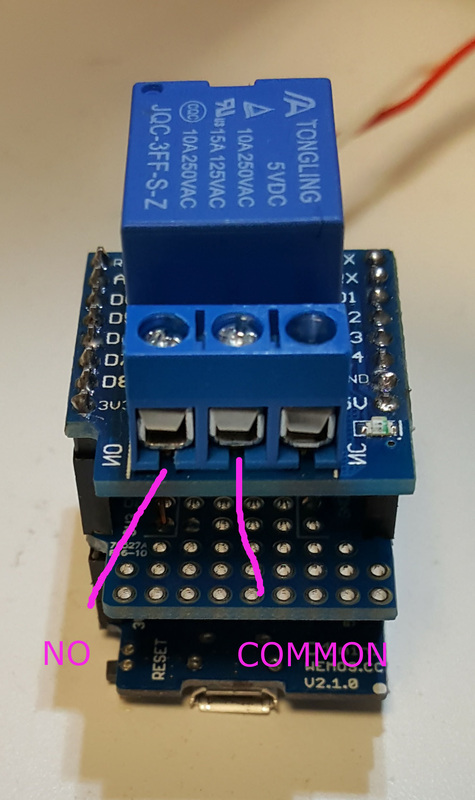 Using a bell wire pair, connect one wire to the 3.3V pin, and the other to D2. Also, I’ve added a pull-down resistor between D2 and ground. The pull-down keeps the signal from “floating” (sending an unknown level). On the other end, use the NO (normally open) terminal for one wire and the common terminal for the other. 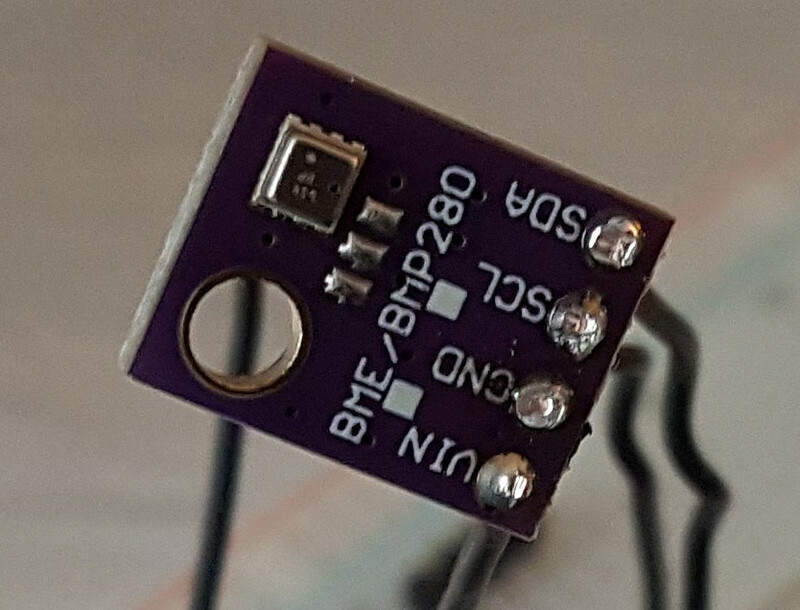 Connect the four pins of the BMP280 sensor as labeled. Rember that my code uses D5 and D6 for SDA and SCL, not the defaults of D1 and D2. 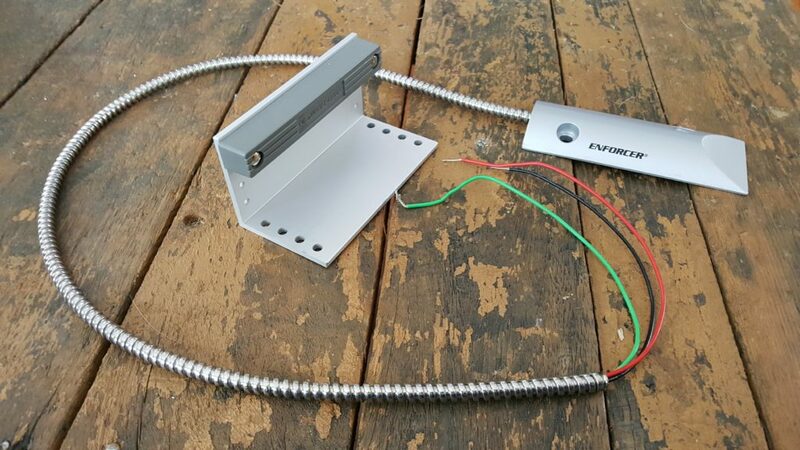 Your garage door opener should have at least four terminals – two for the open button and two for the safety circuit. Follow the wires from your open button to find the two you need. Otherwise, use a short piece of wire to short the pairs of terminals together until the door opens. Run a pair of bell wire from the opener terminals to the relay. Use the common terminal and the NO terminal on the relay. The GitHub repository includes a configuration file for Home Assistant. Integrate these entries into your configuration.yaml file. Note that this file itself is not a complete configuration file. Please leave your questions or suggestions below. Yesterday I wanted to beef up a ListView-based page with additional navigation controls. Specifically, I decided to add buttons to jump back 5 and ahead 5 pages in the list. With a little bit of class extension, this was easy to do. First step was to extend the Pageclass to add additional methods. Mimicking the existing methods for next and previous pages, these four new functions return information on the previous five and next five pages of the list. To use my new PageFiveclass, I also extended the Paginator class. Lucky for me, the authors have included the _get_page()method as a hook to modify the Pageclass used. Simple to override. This was a fun little exercise. I used the pico_django version of Mini Django, from Github user Tim Watts, to deploy a quickie XML feed today. Fun! 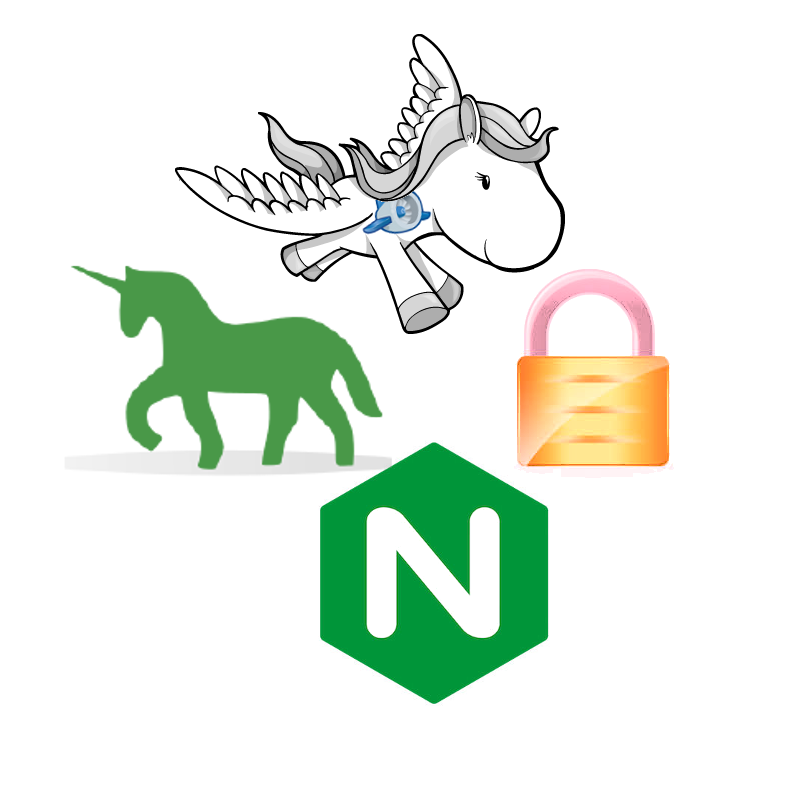 I can find many examples of using Django, Gunicorn, and Nginx for an application, and also ways to implement HTTPS on Nginx, but not all together. This post will document my final configurations and explain my decisions. The first server section grabs any http traffic coming in on port 80 and redirects it to the https URL on port 443. Handling https traffic was trickier. We need to pass all of the header settings from the incoming request on to gunicorn/Django at localhost. All of the proxy-set attribute values in the location section came from a little bit of trial and error. The setting for proxy-read-timeout is admittedly high – five minutes! This application has one longer running transaction that was exceeding the 60 second default. This value needs to match the timeout setting in the gunicorn settings. I’ll probably lower it to a more respectable two minutes before hitting production. I’m using 3 workers – plenty for my expected load. The timeout is set to 300 seconds, which is the same found in nginx.conf above. These should match. The bind setting is commented and moved to gunicorn.service so that I can use this file for more than one instance of the application. A second service file can specify a unique port for its copy of gunicorn. Since my app is stored in a git repo (on a company server, not github), I don’t want to include any security information like the SECRET_KEY in a versioned file. Therefore, this guy is not included there – although an example file is. The Environment variables set here are read by Django at startup. The ExecStart line starts by running the version of gunicorn found in the virtualenv for this instance. Setting up a virtualenv is beyond this scope of this post, but I hope that if you’ve gotten this far you know all about them. Note that the bind parameter includes the port number used for this instance of gunicorn as mentioned above. I hope this helps someone setting up a Django app. Please drop a note in the comments with your experience. I’d also invite questions, as well as comments on how I can improve my configuration. Thanks all! A project at work requires that I authenticate users using an LDAP service. Who knew it would be so easy?!? I’m using Django 1.9.2, but I imagine that this will work with other versions +/- a few releases. Python version is 3.5. The library that does the magic is django-auth-ldap. For Python 3.x, pyldap is required, while python-ldap is used for Python 2.x. I also had to install some system libraries: libsasl2-dev, python-dev, libldap2-dev, and libssl-dev (on Ubuntu). The AUTHENTICATION_BACKENDS setting is not defined in the default Django settings.py file using v1.9.2. However, the code I use below expects the variable to exist. Therefore, I added it in with the default setting. You may have other backends already in use. This code lives at the end of settings.py. Use your own LDAP URI, ou (Organizational Unit), and dc (Domain Component). The first line adds an additional authentication backend to the tuple. Next, we define the path to the server. Note that I’ve used a secure protocol (ldaps). This is essential to keep the credentials passed to the server encrypted. The third line sets up a direct bind with the supplied user. I’m sorry to say that I’m not an LDAP expert at all, so I can’t supply much advice if this doesn’t work for you. Buy your LDAP admin a lunch sometime and ask your questions while waiting for the food. I’m settling in to a new job in a new town, and life is pretty good. Unfortunately, my duties don’t include any chance to program in Django. Our main software vendor is moving from Oracle Forms to Groovy/Grails, so I’m sure I’ll be learning more about that platform. However, I would still like to keep my Django skills sharp, so I am offering my services to any non-profit group that needs an extra Django hand. No salary is expected, just a chance to get involved. An open source project would be a great place for me to assist, and would also be a learning experience for me. Is there a project out there that needs a contributor with Django knowledge? A charity or other non-profit would be another option. Perhaps there is an association developing OSS software for non-profits to use. With my experience supporting fundraising and higher education, I feel I could make a meaningful contribution. If you have an opportunity fitting the description above, or know someone who does, please send me a message dan@dashdrum.com. I am ready to help! This is a complicated process I followed to try to make things easier. It started with an article discussing how to Make Gmail Your Gateway to the Web. Basically, he is trying to make his GMail account his gateway to everything. I’ve got my Google Apps account all setup to received email from every account with filters and tags and alternate accounts. The calendars are shared with the rest of the family (if I could only get everyone else to use them). The only thing he’s done that I haven’t is what he calls “update and track your social networks via IM”. So, I setup the ping.fm and notify.me accounts as he describes, and tried it out. It all worked pretty well except I coulnd’t get the notify.me account to validate GTalk. A little Google research and I found that I have to add 10 SRV entries in my DNS for the domain to property route the jabber messages to Google. This Google article explains it pretty well. Next, I had to figure out how to enter this info into a Dreamhost account. I found that the correct method is to enter “_xmpp-server._tcp” in the name field and “5 0 5269 xmpp-server.l.google.com.” in the value field (be sure to include the period at the end). After a little time for the DNS to get settled, I tried the validate process again, and it worked great. OK, so after all of that, let’s try it out. Ping.fm works exactly as advertised. I setup micro-blog messages to go to Twitter, and status updates to both Twitter and Facebook. It all works via the chat client in GMail. However, there is a problem. In the IM that comes in from notify.me, I can’t tell who sent the message. There isn’t any setup of the format that I can see, but it wasn’t there. I posted a suggestion message to the service. We’ll see how long I keep this setup going. This post originally appeared on the Linux Server Diary.